​​​​​​​ AUSTIN – The newest mixed-use project in downtown Austin—known as Block 71—includes office, retail, and restaurant space, as well as a public plaza with a performance area and food trucks. Trammell Crow Co. is leasing the land from the UT System for the 770,500-sf project, which will be dominated by a 36-story office tower. With 665,000 sf of offices, the tower will be the city’s largest office high-rise. In addition, a food hall will be a significant feature in what’s now Claudia Taylor Johnson Hall, which once housed Austin’s post office, and will be preserved as a key component of the mixed-use project. The West Sixth food hall will occupy the former mail-sorting room of the old post office, which dates back to 1914. 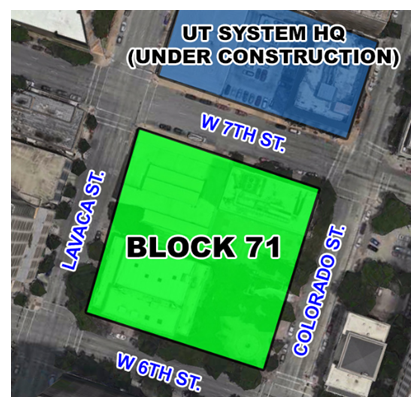 Trammell Crow plans to kick off construction of Block 71 in January 2018, with completion set for March 2021. Check out more mixed-use stories across Texas.